some of which have not only local but international significance. In the eighteenth century there were few Black residents in Chatham-Kent. Sally Ainse, the wealthy Indian fur trader, possessed one or two Black slaves who helped her work her huge property in the Dover area. Some white Loyalists were known to bring their slaves with them when they fled the new United States to resettle in Upper Canada. Edward Smith, a former American slave and an Empire Loyalist himself, received a land grant in the second concession of Raleigh and is said to be the only Black to own land along the Thames in 1793. Five other Black men were listed as residents in the same township that year. In a survey of the village of Chatham for 1790 – 1791, an unknown black man is listed as living in a cabin on the north side of the Thames River. importation of slaves. It also allowed present owners to keep their slaves but any children born to them were to be freed by the age of 25. Finally in 1833, Great Britain passed the British Emancipation Act making slavery illegal in the British Empire. This legislation made Canada the Promised Land and aided by Quakers and other antislavery workers many enslaved people were able to achieve freedom. 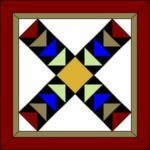 The choice of the Wild Goose Chase block with its directional pattern is an appropriate one since it is believed that quilts with their specific patterns were used by the operators of the Underground Railroad to send coded messages. The passing of the Fugitive Slave Law by the U.S. Government in 1850 brought a new wave of Black refugees into Canada. Southern slave owners could now legally apprehend escaped slaves who had made it to free northern states. Unfortunately many free Blacks were also captured and sold again into slavery. seventies, seeking freedom for his second wife and six of his 26 children, he fled with them to Kent County. He made his living as a mason in the Dawn Settlement near Dresden. In the 1870’s he retired to Chatham where he died at the age of 110. As more Blacks came to Canada so did kidnappers and slave catchers and as a result the Chatham Vigilance Committee was formed. A one time mayor of London, Ontario suspecting that a young boy was about to be tricked into slavery as he boarded a train, was able to send a telegraph to Chatham and a crowd of nearly 100 people armed with clubs and staves boarded the train and rescued the child. Another story tells of two southerners checking into Chatham’s Royal Exchange Hotel. They had come to reclaim 20 year old Joe Alexander but when a crowd appeared and Joe explained that the men were owners of one of the largest slave pens in the south, the men were escorted to the train station and Joe was free. While the Promised Land guaranteed freedom, the fugitives soon realized that it did not promise equality. Almost every aspect of their lives reminded them that they were considered inferior and it was realized that only by living an exemplary life, could they prove themselves. Education was seen as an important means to improving their lot in life but in some communities, Black children were not welcome in the common schools. Such was the case in Chatham and separate and often inferior Black schools persisted here until 1890. It is ironic to note that many white children attended Rev. King’s school in Buxton which was well known for its high quality education. Even from the earliest days of slavery the church was important as it offered socializing and the promise of a better life in the next world. Chatham-Kent’s Black residents have continued the tradition to this day. In the 1850’s several Baptist congregations came together to form the First Coloured Baptist Church of Canada West. Today a brick church stands at 135 King Street East where once stood the original frame building. In fact a portion of the structure still remains and floor beams of the first church can be seen through plexiglass panels in the lower auditorium. Another denomination, the British Methodist Episcopal Church was an off-shoot of the African M.E. Church, an American assembly. Today the BME Freedom Park stands at the corner of Princess and Wellington Streets where the church once stood. Another type of commitment by Chatham-Kent’s Black community seems a bit surprising, given the inequality factor. Just as many of their fore bearers had fought in the American Revolution and the War of 1812, Chatham’s Blacks rallied to the cause when the McKenzie rebellion broke out in 1837. A militia unit, the Coloured Company of Chatham, existed until 1843. During this time its men served as Chatham’s main fire fighting force and in 1842 their quick action prevented a fire which had destroyed a business and two homes from spreading. In the 1840’s and 50’s, when Chatham’s population was one third Black, the town was considered a mecca for refugees but unfortunately much prejudice existed as well. One popular politician who was a member of Parliament and a school commissioner, was vehemently opposed to Black settlement. When election time came around, Blacks from all over Kent County came en mass to the courthouse to cast their vote, taking particular pride in the fact that each voter could sign his name in the register while many white voters could only make their mark. era census recorded many skilled labourers and business owners: 6 master carpenters, 6 master shoemakers, 4 blacksmiths, 2 watchmakers, 4 cabinetmakers; 1 gunsmith; 6 grocers; a cigar maker; 3 printers, brick layers and masons to name but a few. James Jones, also known as Gunsmith Jones took first prize for his guns at the Grand Provincial Exhibition. During this time many highly educated Blacks made Chatham their home. Dr Martin Delaney, the first Black to graduate in medicine from Harvard, opened an office on William St. A cholera epidemic broke out in Chatham and it was his plan that brought the disease under control. When the American Civil War broke out, he went to Washington to offer his services as a recruiting agent for the Union army. President Lincoln was deeply impressed and Delaney was made a Major, the highest rank conferred on a Black during the Civil War. Dr. Anderson Ruffin Abbott, who was the first Canadian born Black doctor, served as a surgeon in the Union Army during the American Civil War. After President Lincoln’s assassination, Mrs. Lincoln presented Dr. Abbott with a shawl worn by the president at his 1st inauguration. Some of the many positions held by Dr. Abbott were Coroner for the County of Kent, President of the Chatham Literary and Debating Society and President of the Chatham Medical Society. Mary Ann Shadd was a feisty, outspoken activist, particularly in the field of education. She and her brother Isaac moved their newspaper The Provincial Freeman from Toronto to Chatham. It was a very well respected paper whose motto was “Self Reliance is the True Road to Independence.” She left Chatham to become an army recruiter during the Civil War, then a school principal and finally a lawyer in Washington D.C. Chatham lost many Black citizens before, during and after the Civil War. Understandably the Civil War affected Chatham-Kent’s Black population. Many went to help the cause. Chatham also played an integral part in an event that led up to the war. John Brown was a white abolitionist from Kansas who led an ill-fated raid on the U.S. arsenal at Harper’s Ferry in an attempt to start a slave revolt. While many here felt the idea was doomed he did find supporters and plans for the raid and a provisional government were drawn up in Chatham. Osborn Anderson, a printer at the The Provincial Freeman, who later wrote an account of the raid, participated and was one of only five and the only Black to survive the raid. Chatham-Kent has a very rich Black history and local historians, authors, museums and libraries work hard to preserve this very important chapter in our area’s life story. Special thanks to our very own expert, Virginia Travis, who supplied much detail from her vast knowledge and personal library.